I started working for a company assembling bikes and I get paid by the piece which is usually fine till I get to this one bike. 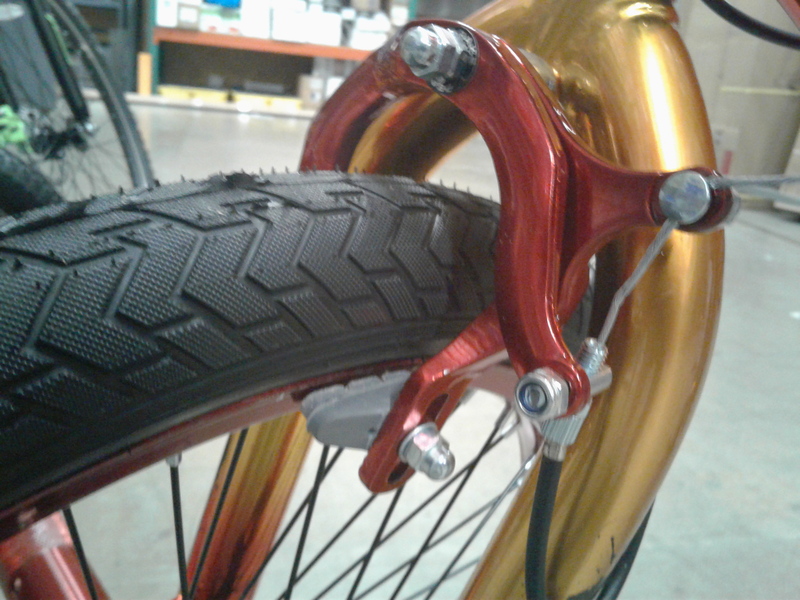 The front brakes just never hold no mater how tight I get them. Is it just the chrome rim and I can leave them as is convince the store it's got to be bedded-in by the child that buys it? Cause I can't be taking sand paper to the rim or they'll be marked damaged. Looking at the photo, it appears you have the cable housing barrel adjuster attached at the lower point between the two arms (on the front caliper), with the cable clamp nut at the higher attachment point (back caliper). Except for images of Bropton brakes, I've never seen that arrangement. Try reversing the connections so that the barrel adjuster is on the back caliper, with the housing coming from above. I believe you'll find that provides better braking power. How do I setup these brakes? What kind of frame and brakes are these?